The first day we stepped out of the sanctuary (what I have been calling the campus of Madras Christian College) to see what my new world looked like beyond the sanctuary, we encountered cows chilling casually on the side of the road. Our wanderings took us to the town of Tambaram, and I was amazed at the many differences in my surroundings as compared to the five other countries where I have lived. 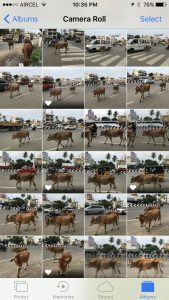 Once back in my sanctuary, I was scrolling through my photos and realized I had taken 33 pictures of the same two cows! I was fascinated by the fact that I had taken so many pictures of something that seems so normal to Indians. What struck me was that these animals are able to aimlessly wander around wherever they please, like stray dogs. Also I was concerned about their health–they are so skinny that you can see their ribs and hip bones perfectly etched in their bodies. Sophia Pessagno: We went out today; just outside of the college. We saw cows. This is the kind of mentality in which I was raised. I grew up visiting my family’s cattle ranch in the northern part of Argentina. Cows have never been a sight for amazement for me; they have always been there in the background munching on some grass or wading through the river. I have always known they are animals, but since I was small I was taught to identify how to raise a cow so it would taste better and what cut of meat is the juiciest. I knew they would eventually be destined for my plate or someone else’s. 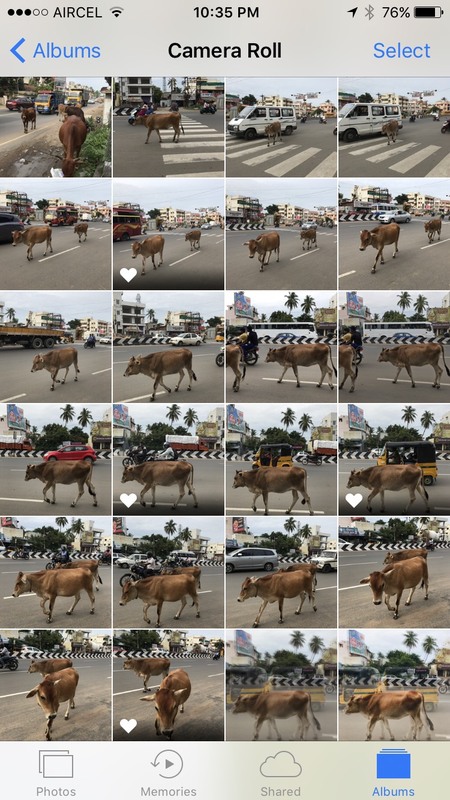 Despite my early and close up exposure to cows, when we landed in the Chennai airport and were greeted not only by the tour guide but also by a cow scratching itself on a bush that was near the bus, I knew that cows’ ubiquitous presence would challenge my mindset about these animals. When asked what I would miss most from home I replied, “eating meat.” I think that during my stay here in India I will gain a sense of compassion towards these animals, an emotion that will be challenging to confront when I next visit my family’s ranch. I am fascinated to learn why the cow has been deemed a holy animal and how its presence will affect my lifestyle. A cow “spoke” to my grandson at age 13 and he hasn’t eaten meat since.he is now 18.